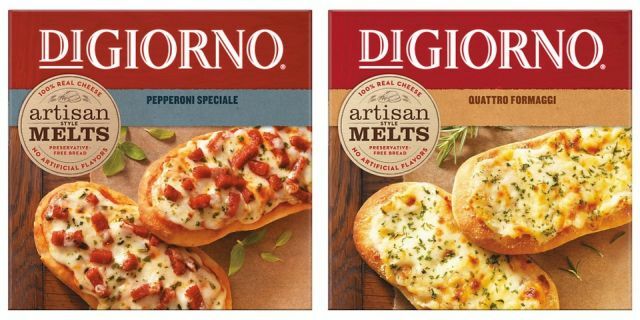 Looking to cater to consumers seeking more snackable pizzas, DiGiorno debuts new Artisan Style Melts, which are smaller-serving pizzas made with artisan-style focaccia bread. - Spicy Sausage Pomodoro - Rosemary focaccia bread with arrabbiata sauce, Italian sausage, fire-roasted bell peppers, and reduced-fat mozzarella, Romano, Parmigiano, and Asiago cheeses. - Quattro Formaggi - Rosemary focaccia bread topped with creamy Alfredo sauce, reduced-fat mozzarella, smoked gouda, fontina, Parmesan, Asiago, and Romano cheeses. - Pepperoni Speciale - Garlic and onion focaccia bread topped with pepperoni, marinara sauce, and three types of mozzarella cheese. - Chicken Bruschetta - Focaccia bread topped with white meat chicken, roasted garlic, Roma tomatoes, and a premium blend of cheeses and basil. DiGiorno Artisan Style Melts can be found at grocery stores nationwide for a suggested retail price of $3.99 (may vary). Each box includes two pizzas. They can be cooked in the oven or microwave.